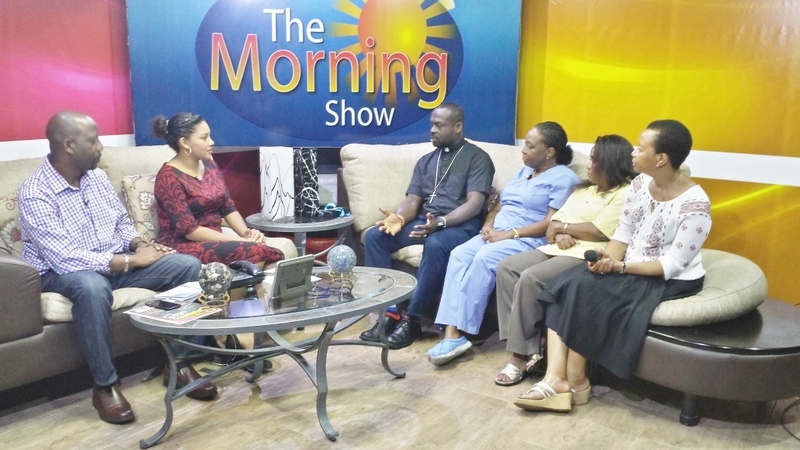 Armin Arana and Tarun Butcher interview Father Tony, Dr. Arlene Richards, Dr. Patricia Rowe-King, and Erna Cunningham at Love FM TV Belize. 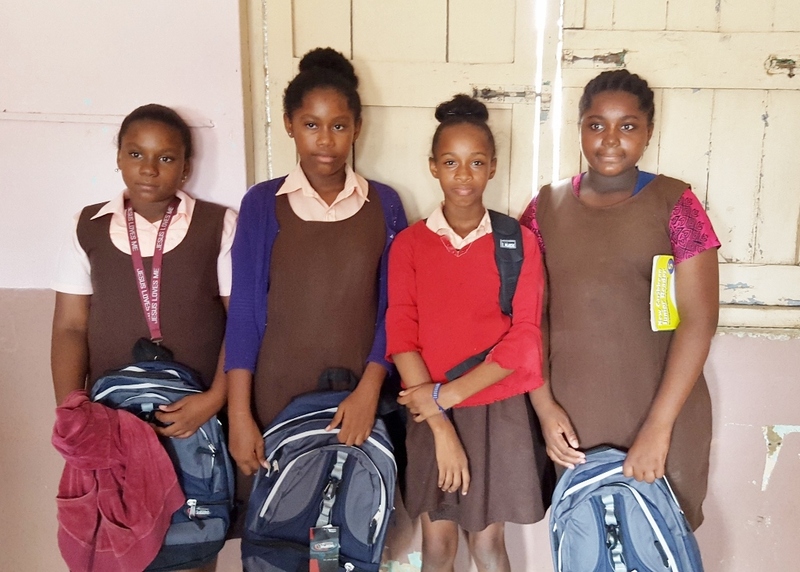 Students with their new back packs. Morning Show,” hosted by Armin Arana and Tarun Butcher. Dr. Patricia Rowe-King, Dr. Arlene Richards, Erna Cunningham, and I went to the interview. It was a relaxing and wonderful, and apparently well received. After the interview, I needed to make stops at the various work sites, but first it was back to the hotel for breakfast, since we did not have the time after the Eucharist to do so before going the interview. Following breakfast, I assisted Sehon, Henry IV, and the hotel’s bellmen with loading gifts into two trucks for the children and items that were to be later delivered to the Karl Heusner Memorial Hospital (KHMH). Father Tony, receiving a gift from Myrna Smith, Principal of the Anglican School at Queen’s Square. their bags, and the love and generosity of persons and companies that donated these gifts. All of this is as a result of Christ putting it into the hearts of people to express and extend such generosity. 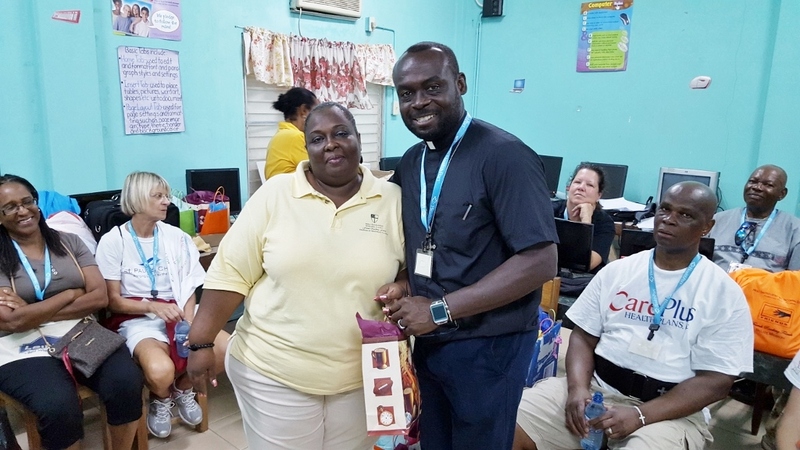 Following the giving out of bags, the Principal, Ms. Myrna Smith, and Staff of the school, made their own presentations to us as a means of appreciation for all that we have done at the Queen’s Square School. 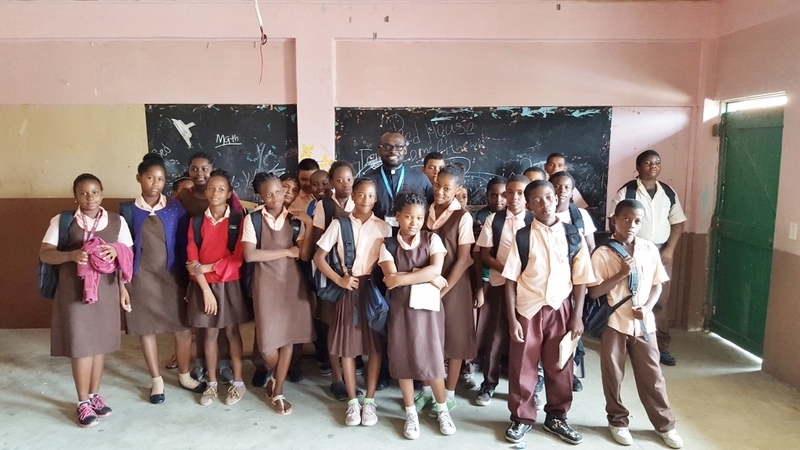 After playing with the children in the playground, and touring the newly painted building and the refurbished restroom facilities, it was off to St. Mary’s Anglican School to the Health Clinics. 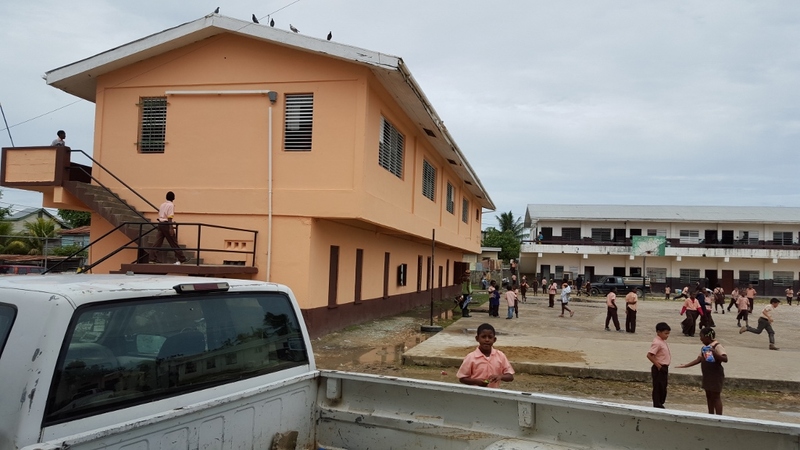 Fortunately, it was not as busy as the previous four days, which meant that the team was able to conclude seeing patients and clean up by the scheduled time of 1:30 p.m. 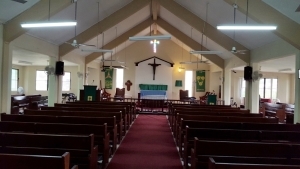 The interior of All Saints’ Anglican Church. academic staff had already received their gifts. I met with the Principal of the School, Mrs. Theresa Roches, who had attended the seminar on “Scripture and its role in our lives,” which I led on Wednesday. 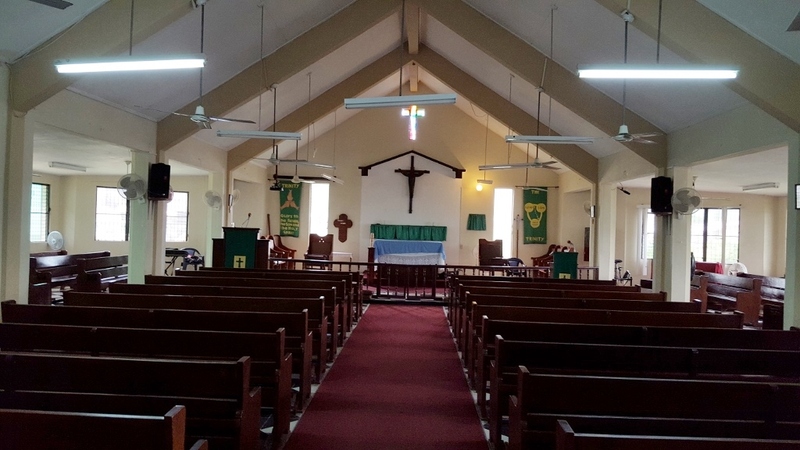 I was also given a tour of All Saints’ Anglican Church, which is situated next door to the school. The Missionaries with Hospital CEO at Karl Huesner Memorial Hospital, Belize City. From L-R (Standing): Christopher Rodriquez, Father Tony Holder, CEO of the K.H.M. Hospital, Dr. Adrian Coye, Dr. Patricia Rowe-King, Linda Schlepp-Gray, and Dr. Arlene Richards. Carlene Nugent, Erna Cunningham, Bibi Achaibar. Next, it was on to the Karl Heusner Memorial Hospital (KHMH), where members of the Health team including Dr. Arlene Richards, Dr. Patricia Rowe-King, Carlene Nugent, Bibi Achaibar, Christopher Rodriquez, Linda Schlepp-Gray, Erna Cunningham, and I, met with the Hospital’s CEO, Dr. Adrian Coye, and the Public Relations Officer of the hospital. We presented the hospital with medical supplies and then toured parts of the health facility. On leaving the hospital, I visited the Dorothy Menzies Child Care Center, at which we had engaged in missionary work last year. This facility houses about 70 children who are either orphans or parents are unable to take care of them. 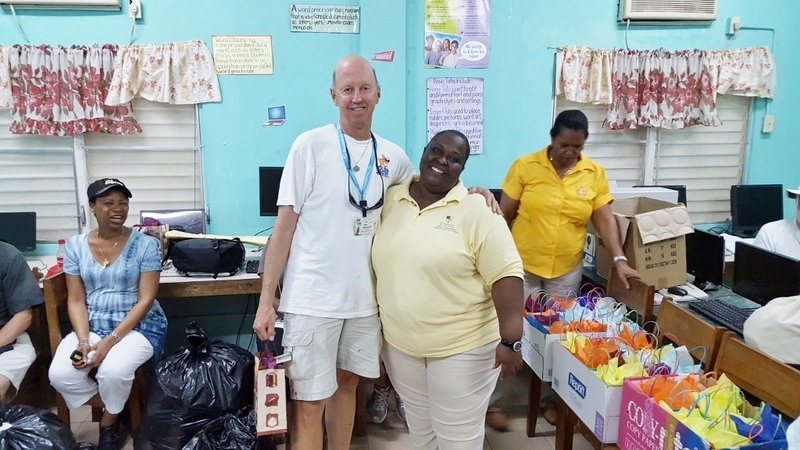 This center was one of two major places at which we worked extensively last year in the areas of pediatric health care, Vacation Bible School, and construction, and we presented them with a number of gifts for the children and the institution. I wanted to meet the children and to see the work that we had done. The members of our mission team who did not visit the hospital went to the Menzies Center to visit the children, prior to my arrival. The night was spent at the hotel, attending the 60th Birthday Celebration of one of our missionaries, which was hosted by his wife. It was a lovely party with great food, wonderful fellowship, dancing, and beautiful Belizean music performed by a live band. It was truly a fun time. I was asked to bless the meal, and later on, Father Jon and I blessed the couple and the birthday cake. Following the party, we retired for the night, since the majority of the missionaries were leaving in the morning for home in Florida. 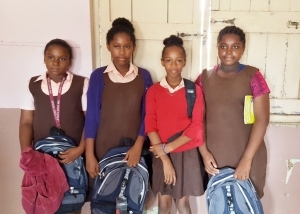 Father Tony with students who received gifts of back packs. 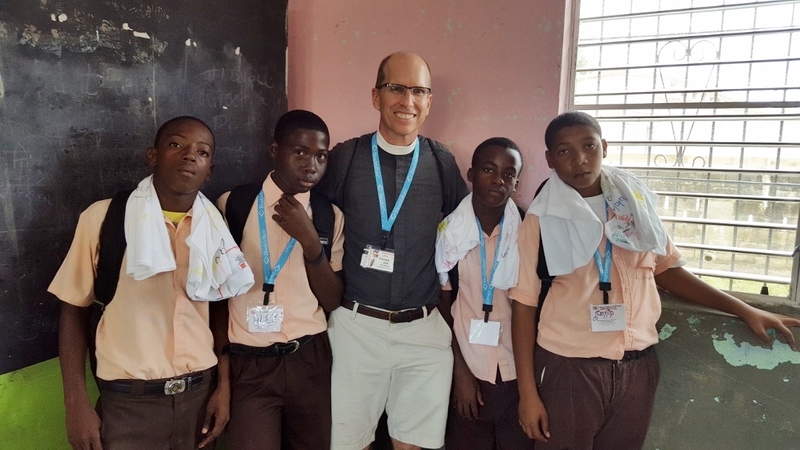 Father Jon with some of the male students at Queen’s Square Anglican School. Part of the campus at the Anglican School at Queen’s Square. Bob Webster, Construction Co-Leader, receiving a gift from Principal, Myrna Smith.